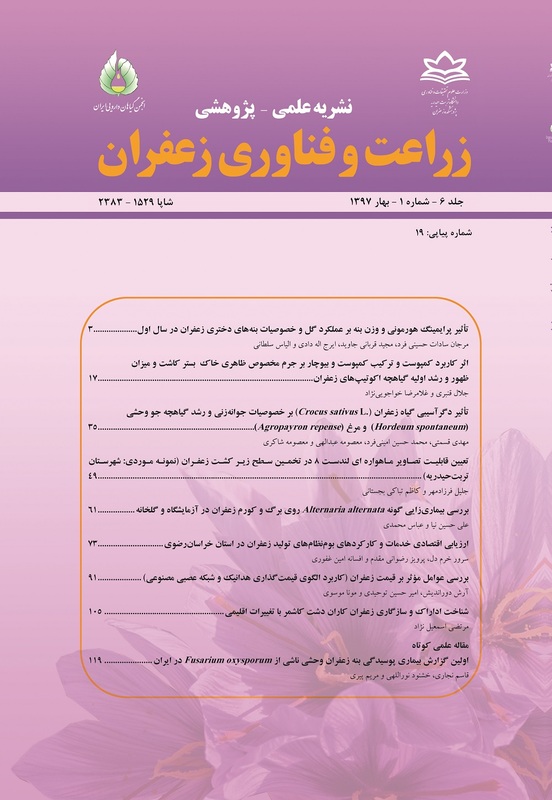 زعفران به عنوان محصولی کشاورزی ارزشمند در سطح ملی و بین­المللی، به شیوه­های مختلفی توسط مصرف­کنندگان ارزش‌گذاری می­شود و قیمتی که برای آن پرداخت می­شود به عوامل متعددی بستگی دارد. با شناسایی این عوامل می­توان زعفران را با قیمتی در بازار عرضه نمود که مطابق با ترجیحات مصرف­کننده باشد. لذا، هدف اصلی این مطالعه ارزیابی عوامل مؤثر بر قیمت زعفران در شهر مشهد با استفاده از مدل قیمت­گذاری هدانیک است. وجه تمایز این مطالعه نسبت به مطالعات پیشین استفاده از رهیافت تحلیل حساسیت در چارچوب شبکه عصبی مصنوعی است. اطلاعات مورد نیاز تحقیق از طریق روش نمونه­گیری تصادفی ساده از 120 خریدار زعفران در سطح شهر مشهد جمع­آوری گردیده است. با در نظر گرفتن 14 متغیر توضیحی، نتایج مطالعه نشان داد که متغیرهای سن و نام تجاری کمترین اثر را بر قیمت زعفران دارند، در حالی که متغیر اهداف مصرفی اثر قابل توجهی بر قیمت این محصول دارد. در میان اهداف مصرفی، مصرف تغذیه­ای دارای اثر مثبت و مصارف دارویی و صنعتی اثر منفی بر قیمت زعفران دارند. با توجه به یافته­های پژوهش، به تولیدکنندگان و عرضه­کنندگان زعفران توصیه می­گردد که در استراتژی قیمت­گذاری این محصول به ترتیب به نوع مصرف، شیوه فروش و نوع زعفران توجه نمایند. Saffron, a valuable agricultural product in the national and international level is valued by consumers in different ways and the price paid for it depends on different factors. Identifying these factors can be helpful to marketing saffron with the price that is consistent with consumer preferences. The major aim of this study is to evaluate the factors that affect the price of saffron in Mashhad using the Hedonic pricing model. What distinguishes this study from previous studies is using the sensitivity analysis approach in the context of artificial neural networks. The information needed for this research was collected from 120 saffron buyers in the city of Mashhad with the random sampling approach. Considering the 14 explanatory variables, the results showed that age and brand have the least impact on the price of saffron, while the consumption goals variable has a significant effect on the price of this product. Among the goals, nutritional uses has a positive effect, and medical and industrial uses have a negative effect on the price of saffron. According to the research findings, manufacturers and suppliers of saffron are recommended to price the product according to the buyers’ consumption goals, sale style and the saffron type, respectively. Cantarella, G.E., and Luca, S.D. 2005. Multilayer feedforward networks for transportation mode choice analysis: An analysis and a comparison with random utility models. Transportation Research Part C: Emerging Technologies 13 (2): 121-155. Carew, R. 2000. A hedonic analysis of apple prices and product quality characteristics in British Columbia. Canadian Journal of Agricultural Economics 48 (3): 241-257. Carew, R., Florkowski, W.J., and Smith, E.G. 2012. Hedonic analysis of apple attributes in metropolitan markets of Western Canada. Agribusiness 28 (3): 293-309. Coulibaly, P., and Baldwin, C.K. 2005. Nonstationary hydrological time series forecasting using nonlinear dynamic methods. Journal of Hydrology 307 (1): 164-174. Curry, B., Morgan, P., and Silver, M. 2001. Hedonic regressions: misspecification and neural networks. Applied Economics 33 (5): 659-671. Dewenter, R., Haucap, J., Luther, R., and Rotzel, P. 2007. Hedonic prices in the German market for mobile phones. Telecommunications Policy 31 (1): 4-13. Dimopoulos, Y., Bourret, P., and Lek, S. 1995. Use of some sensitivity criteria for choosing networks with good generalization ability. Neural Processing Letters 2 (6): 1-4. Ethridge, D. E., and Davis, B. 1982. Hedonic price estimation for commodities: an application to cotton. Western Journal of Agricultural Economics 7 (2): 293-300. Gevrey, M., Dimopoulos, I., and Lek, S. 2003. Review and comparison of methods to study the contribution of variables in artificial neural network models. Ecological Modelling 160 (3): 249-264. Gevrey, M., Dimopoulos, I., and Lek, S. 2006. Two-way interaction of input variables in the sensitivity analysis of neural network models. Ecological Modelling 195 (1): 43-50. Goethals, P.L., Dedecker, A.P., Gabriels, W., Lek, S., and De Pauw, N. 2007. Applications of artificial neural networks predicting macroinvertebrates in freshwaters. Aquatic Ecology 41 (3): 491-508. Huang, C.L., and Lin, B.H. 2007. A hedonic analysis of fresh tomato prices among regional markets. Applied Economic Perspectives and Policy 29 (4): 783-800. Khashei, M., and Bijari, M. 2011. A novel hybridization of artificial neural networks and ARIMA models for time series forecasting. Applied Soft Computing 11 (2): 2664-2675. Lancaster, K.J. 1966. A new approach to consumer theory. The Journal of Political Economy 74 (2): 132-157. Maanen, B.V., Coco, G., Bryan, K.R., and Ruessink, B.G. 2010. The use of artificial neural networks to analyze and predict alongshore sediment transport. Nonlinear Processes in Geophysics 17 (5): 395-404. Martinez Garmendia, J. 2010. Application of hedonic price modeling to consumer packaged goods using store scanner data. Journal of Business Research 63 (7): 690-696. Muñoz, R., Lagos Moya, M., and Gil, J.M. 2015. Market values for olive oil attributes in Chile: a hedonic price function. British Food Journal 117 (1): 358-370. Parcell, J.L., and Schroeder, T.C. 2007. Hedonic retail beef and pork product prices. Journal of Agricultural and Applied Economics 39 (01): 29-46. Rosen, S. 1974. Hedonic prices and implicit markets: product differentiation in pure competition. Journal of Political Economy 82 (1): 34-55. Schollenberg, L. 2012. Estimating the hedonic price for fair trade coffee in Sweden. British Food Journal 114 (3): 428-446. Selim, H. 2009. Determinants of house prices in Turkey: Hedonic regression versus artificial neural network. Expert Systems with Applications 36 (2): 2843-2852. Seppä, L., Latvala, T., Akaichi, F., Gil, J.M., and Tuorila, H. 2015. What are domestic apples worth? Hedonic responses and sensory information as drivers of willingness to pay. Food Quality and Preference 43: 97-105. Vickner, S.S. 2015. Estimating the implicit price of convenience: a hedonic analysis of the US breakfast sausage market. Agribusiness 31 (2): 281-292. Waugh, F.V. 1928. Quality factors influencing vegetable prices. Journal of Farm Economics 10 (2): 185-196.